How mysterious! The lotus remains unstained by its muddy roots, delivering shimmering bright jewels from common dew. Who we are and what we want for ourselves and those we love is created through our experience and through our thinking process. We live an active mental life that seeks out images and builds castles in our inner environment. Then, through hopefully skillful actions, we try to make those dreams a reality in our external environment. One of us may have dreams of being a good parent and that seed is nurtured in our mind with images of things a “good parent” does or says to his child. Another of us may have an idea for a garden or a type of business and begins to formulate concepts which are likely to become a reality with effort. When these dreams, ideas, and concepts are made real, we feel a sense of accomplishment and our vision of being an effective person is clear. When these aspirations meet with obstacles or are criticized as inadequate, we become clouded in our vision of who we are and what we want. Our mental life is like a glass filled with water and mud. our life are clear and other parts are mucky with slime and ooze. say that slime and ooze are crucial to our personal growth. Lotuses begin their life in the mud, cradled and nourished there until the blooms rise above the water clean and untainted by the messiness under water. It’s an inspiring image because most of us aspire to rise above all the inner turmoil and “ickiness” to be beautiful. We want to be able to roll with the punches, share in the joys of others, and take in a beautiful sunset. Sometimes, the contents of the glass are stirred up. When we experience anger, anxiety, depression, frustration, grief, loss, or some challenge to our perception of ourselves or others, mud and water mix to form a system that is murky. In these moments, we lose sight of the clarity of water and all we see is a mess of mud. Whatever we have encountered seems to be the entirety of our being. The poet Rumi asked us to invite in as guests depression, meanness, dark thoughts, shame, and malice as a way of learning from these experiences. However, when we are overcome with such muddiness, it feels like these visitors have taken up every nook and cranny of our mind with no room left for love, compassion, joy or kindness. In fact, we can become quite convinced that the clarity of the water that we saw over the mud was an illusion and the muddy mixture is the absolute reality. We come to believe the worst of whoever has hurt us. The roadblock in our career path takes on monumental proportions. The consequence of a lost contract, an upset client, the end of a relationship or of good health seems like the end of our life. We take our unskillful actions as evidence of our unworthiness. Losing sight of who we are is an easy skill to develop. In fact, we tend to practice clouding our vision as a daily way of being. In order to get things done, we live much of our lives on autopilot. We walk into a room and forget why we went there. We go to the grocery store for milk, buy a bunch of stuff, and forget to buy the milk. We set out on our daily drive to work and can’t remember much of the trip there. We feel frustrated with our aging or preoccupation. Bring to mind your day. When you woke up, were you aware of that moment of growing awareness of what it feels like to be in bed or were you already caught in the activities of the day to come? As you were showering, were you feeling the water on your body or were you already wondering how to get breakfast ready for yourself, your partner and/or your children? At breakfast, were you already in the car? When driving, were you already at that meeting with the boss or colleague that you were dreading? At any given time in the day, we are likely living a time zone or two away. Yet, if asked, we would probably say that we’re very aware of what we’re doing and where we’re going. We have maps, lists, plans, and beeping reminders on our computers or phones to tell us where we are in time and space. In fact, we get indignant if we’re told we’re not paying attention. Many years ago when one of us (Lynette) was in the field of assessing and treating children with Attention Deficit Disorder, we attended a workshop given by Ed Hallowell, who wrote Driven to Distraction. He commented that many adults with ADHD don’t even realize they meet the criteria for the disorder and that the people who can best diagnose the disorder are the partner or close friends of the person. He asked the audience how many of us believed we had ADHD. Both of us looked around at all the people raising their hands; our hands were firmly tucked into our laps. Then Hallowell asked how many in the audience believed our spouse had ADHD. We both raised our hands! Just as the eye cannot see itself and the hand cannot grasp itself, it is hard for us to be aware of who we are in each moment. The busy mind carries us away at the speed of thought and we live in a world where that busy-ness is valued as something positive. At the same time, multitasking and rapid information processing is a necessity in our fast-paced world. Even as this is being written, the computer is scanning for viruses, updating the firewall program, backing up the files online, and recording the keystrokes. The writer of this paragraph is composing, remembering where the reference books are, mentally reviewing the handouts so that there is consistency with this text, wondering if her daughter is enjoying her vacation, and deciding what to have for dinner. We could also throw in a feeling of anxiety about this whole process of writing a book on mindfulness. The problem is not that so much is going on in this moment. That’s the nature of mind; it’s a busy creature that’s been described as being like a monkey that’s drunk and been stung by a bee. It swings rather wildly at times and there is no predicting where it will end up. Problems arise when the peripheral issues trip up the primary intention. If the writer begins to worry about the purpose of the book, whether the references are where she thinks they are, what people will think of this work, worrying about her daughter and whether she’s a good mother if her daughter has a bad vacation and so on, the creative process is now subservient to worry, rumination, and projection into the future. Suddenly, the fingers trip over computer keys, doubt creeps in, and sentence structure goes to mud! 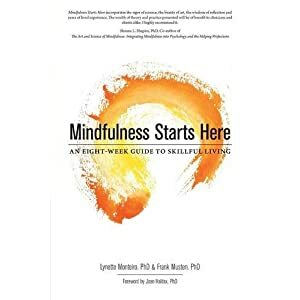 Our good friends and colleagues Lynette Monteiro and Frank Musten have just published a wise and wonderful book on integrating mindfulness into your life. It’s worth a look and a mindful read!